This recipe — from one of my virtual friend who knows a lot about all over plain and tasty Well, my recipe is slightly different from the original, but gingerbread turned out tasty and flavorful. So, in a large bowl stir with tablespoon pumpkin with curd, add sugar, then egg and continuing to stir, add butter(as it lay long time at room temperature — it is well stirred), zest, add gradually flour and baking powder. It turned out sticky, soft dough. In fact, for dough was used cup of flour, the rest (half cup), I sprinkled on the board when knead dough. To be honest, I had not roll it with a rolling pin — it is perfectly splashed by hand. Faced with one BUT — the amount of flour depends on juiciness of pumpkins and size of eggs, so be careful and watch on the situation, you may need more, and possibly less than half a glass. So, after you roll out dough or roll in a flat cake for cookies- consider that thickness isn`t too small — 1 cm — ideal, because then cookies will not be dry. 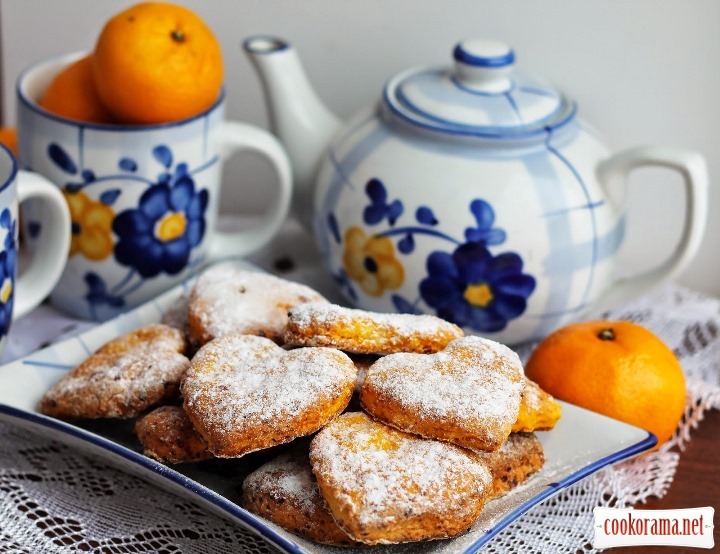 So, cut off cookies (best hearts, as dough is delicate — different leaves and flowers are not very fittable, except they are large, without small elements) and spread on a baking sheet covered with parchment. I did not have this — was over, so I sprinkled a little flour on board. Very little. Bake at 180 C for 12-15 min, maybe you oven needs 15-18 min, the main thing that cookies are not very dark. Cool finished cookies on grid and sprinkle with powdered sugar. In the original recipe there is cardamom and more sugar, but I liked my version very much. Especially with tangerines. 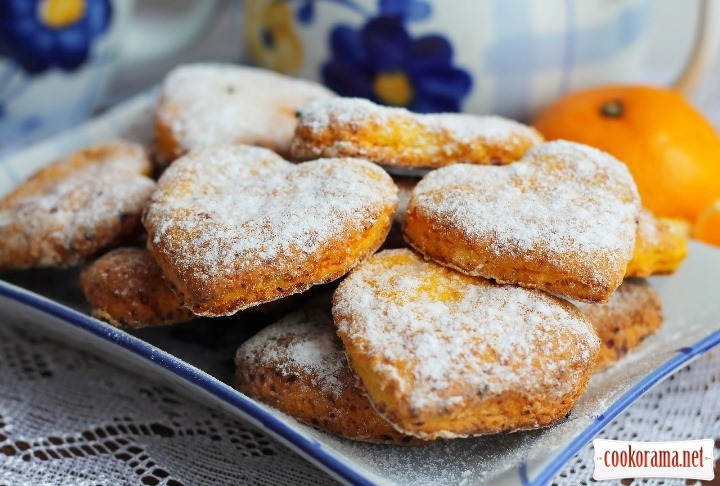 Top of recipe "Pumpkin gingerbread-hearts"